Big, cup-shaped blooms in gorgeous colors make orchid cactus a joy to grow. Show it off in a hanging basket and allow the long stems to cascade over the pot. Flowers emerge at the ends of the stems in spring, and can be 4-6 in (10-15 cm) wide. 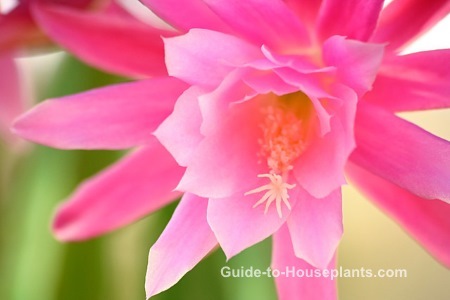 Most epiphyllum grown today are hybrids and may be pink, red, white, yellow, orange, purple or bicolored. Give your cactus plenty of light and you'll enjoy months of blooms. Orchid cactus stems are broad and flat with serrated edges. They are segmented and joined by a midrib. Use sharp, clean pruning shears to prevent tearing the stems. Cut a stem off between segments (the place where they're joined together by a midrib). 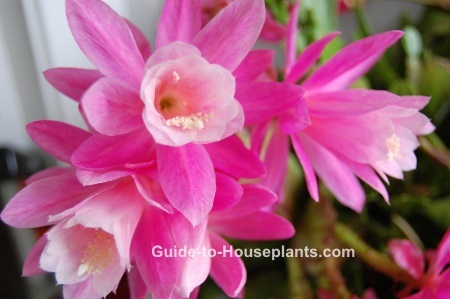 Don't toss out those orchid cactus cuttings! Propagate them to get more of these captivating plants. Give it a winter rest. A cool, dry rest for about 8-10 weeks in winter are needed for the plant to set buds. Water sparingly and stop fertilizing during this time. Shed some light. Keep your orchid cactus in bright, indirect light year-round. If you move it outdoors for the summer, keep the plant shaded from direct sunlight. Feed it potash. High-potassium fertilizer will encourage more blooms. Start feeding in early spring and continue through fall. Leave it alone. Once buds appear, keep the plant in the same location. Changes in light and temperature by moving it around will cause it to drop its buds and flowers. Also keep it away from drafty areas like doorways and heat vents. Repot every 2-3 years, moving up to a pot 1 size larger. It prefers to be slightly pot-bound and blooms best this way. Wait till early spring to repot -- never while it's blooming. 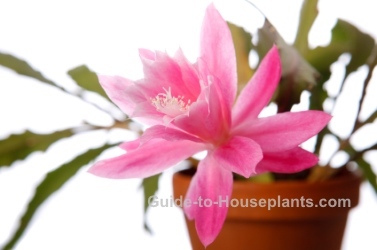 Buying tips: The true orchid cactus is still commonly known as Epiphyllum, but has been renamed Nopalxochia. Many hybrids and cultivars are available. Well-known for their night-blooming flowers, newer hybrids have been developed for daytime blooms. Epiphyllum oxypetalum (shown here) is among the most popular species of this genus. It bears white, fragrant flowers that bloom for one night only -- then wither by morning. If you sneak up on it during the night, you'll catch it in full bloom. Water: Keep the soil moist spring through fall, while plant is growing. In winter, water sparingly until new growth begins in spring. Never allow it to dry out. Shriveled, limp stems are a sign the soil is too dry. Humidity: Moderate -- about 50-60% humidity. Stand the pot on a dish of wet pebbles or use a room humidifier to boost humidity. Temperature: Average room temperatures 60-75°F/16-24°C. To set flower buds, the plant needs 8-10 weeks of cool 60-65°F/16-18°C days and 45-55°F/7-13°C nights in winter. Fertilizer: Feed every 2 weeks from early spring through fall with a high-potassium liquid fertilizer diluted by half. Propagation: Detach 4-6 in (10-15 cm) stem segments in spring and place upright in moist potting mix. 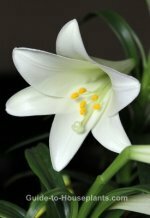 Stem cuttings root easily, but you may wait a few years to see many blooms on a new plant.